Step 4. Scroll down to the page you wish to rotate. Step 5. Click the "Rotate Page 90°" button under the Pages tab in the PDF Converter toolbar. Permanently Rotate PDF Pages- Some programs allow you to rotate a PDF for viewing, but do not allow you to save the rotation. 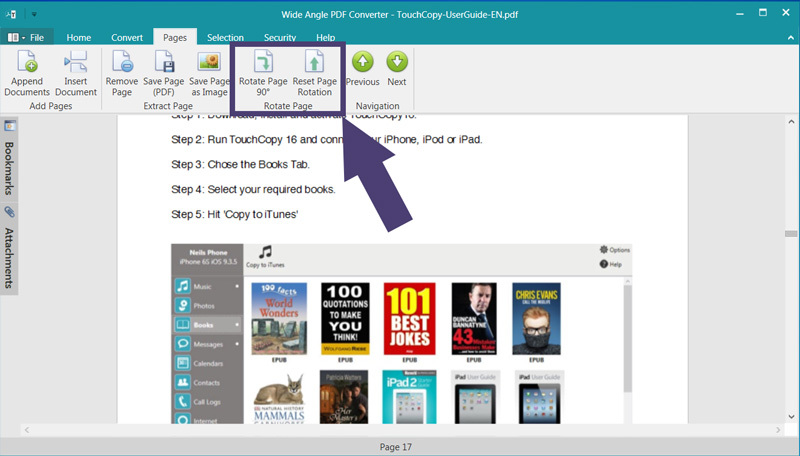 You can rotate each individual page in a PDF document (and save the result) with PDF Converter. To do this, simply scroll to the page which you need to rotate, then click Rotate Page 90°. With each click of this button, the page will rotate through a 90° angle. Do this to rotate PDF and save using 'File' then 'Save'. You can also save the individual rotated page separately by hitting 'Save Page (PDF)'. If you have finished your edits, or no longer wish to have a page rotated, you can go back to having the page in it's original orientation. To achieve this, just hit Reset Page Rotation.